American dream-pop indie darling Youth Lagoon released his second full-length album, Wondrous Bughouse, on 5 March 2013. He and his backing band played an amazing, sold-out show in New York City the very next day, 6 March 2013, at Bowery Ballroom. When we bought tickets to this show, my friends and I were not aware of how important it would be: it was the day after the album release and the week before his performances during South by Southwest, a combined interactive, film and music festival that happens every March in Austin, Texas. I first got into Youth Lagoon (23-year-old Trevor Powers’ stage name) earlier this year. “17“, “July” and “Afternoon” from his debut album The Year of Hibernation became the soundtrack to much of the time I spent commuting, applying to graduate school and generally hanging out online. The shy, melodic, dreaminess to his music and unique vocal styling really reminds me of Beach House and the heavy lo-fi electronic emphasis recalls popular chillwave bands like Neon Indian or Toro y Moi. My roommate and I always say that Youth Lagoon is great writing music–it’s music that can be on in the background peacefully cycling through album rotations, but always ready to blow your mind once you start fully listening. When Wondrous Bughouse came out, I wasn’t really sure what to expect. I really, really like The Year of Hibernation. I can’t tell you how many times indie bands whose first albums are awesome change their sound for the worse with sophomore releases because of mainstream appeal and pressure from record labels. I knew Youth Lagoon was still underground enough not to fall victim to this, but I nonetheless had reservations. With less than 24 hours to listen to Wondrous Brighthouse until I was seeing the band, and likely the majority of the new album, live, I quickly identified the tracks about which I was most excited. The intricate tempo and complex melody changes in “Dropla” and “Raspberry Caine” reflect evident artistic growth and “Mute” displays a more confident, still experimental, but more poppy Powers and company. The show was nothing short of amazing. I didn’t have high expectations for seeing Youth Lagoon live, because at the end of the day Trevor Powers established his sound by himself, with a synthesizer and keyboard, in his room. I’ve seen a bunch of indie/chillwave/experimental bands, even groups as big as MGMT, whose electronic element really doesn’t come through that well live because no one likes watching people DJ when they paid for them to perform. But with the full backing band, Youth Lagoon brought the tracks on both The Year of Hibernation and Wondrous Bughouse to a different level. Normalmag.com’s live capture of “Daydream” off The Year of Hibernation really showcases how awesome this band is: the same kind of wonky sound elements that make the track so good on the album translate live, but the backing band’s musicianship and passion make this song memorable and catchy. The show wasn’t just four dudes with prerecorded laptop beats, edgy “style” and a synth; it was a group of four talented musicians playing songs they were really comfortable with and super into, feeding off the energy of a loyal and excited crowd. I saw Trevor Powers milling about at the Bowery Ballroom bar just before the show started, and it’s clear that he’s excited about what he’s doing. 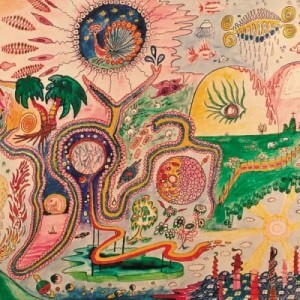 That passion, however muted by the distorted vocals and general kind of malaise inherent in dream-/psych-/chill- pop, makes it really easy to get behind both Wondrous Bughouse and wherever Youth Lagoon goes next. Youth Lagoon is touring throughout North America and his album Wondrous Bughouse is available worldwide on Fat Possum Records. This entry was posted in Arts, Music and tagged Beach House, Bowery Ballroom, Fat Possum Records, MGMT, nyc, South by Southwest, The Year of Hibernation, Toro y Moi, Wondrous Bughouse, Youth Lagoon. Bookmark the permalink.